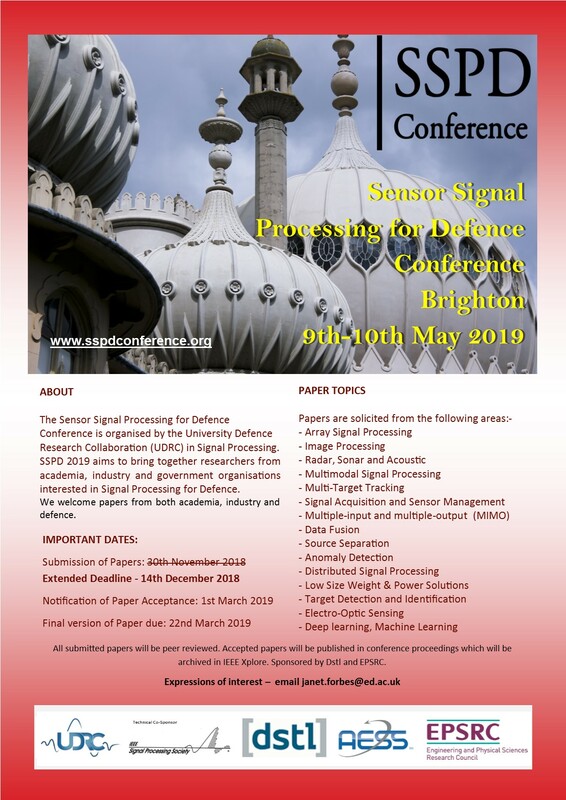 I would like to warmly welcome you to the 8th conference of the Sensor Signal Processing for Defence (SSPD) series. This conference is a fantastic opportunity to present and hear about the latest scientific findings in signal processing for defence. We welcome papers from both academia, industry and defence. This conference will be held in Brighton on the 9-10 May as we are aligning our Conference with ICASSP2019 which takes place on the 12-17 May. I look forward to meeting you at SSPD2019. Technical sponsorship is provided by the IEEE Signal Processing Society and the IEEE Aerospace and Electronic Systems Society. Proceedings will be submitted to the Xplore Digital Library. To see papers, presentations, posters, videos and photos from previous conferences go to SSPD Conference Archive.